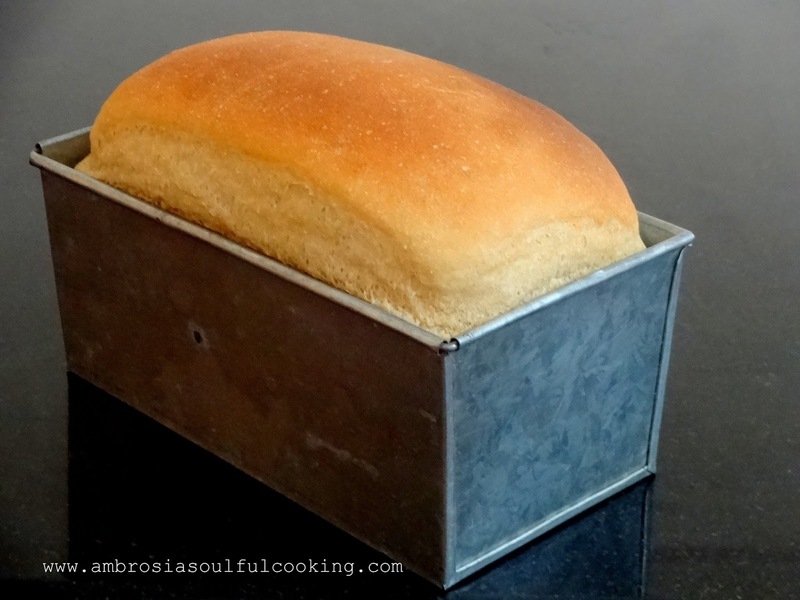 I had to make this to believe that Semolina could actually be used to make a super soft deliciously yeasty loaf. 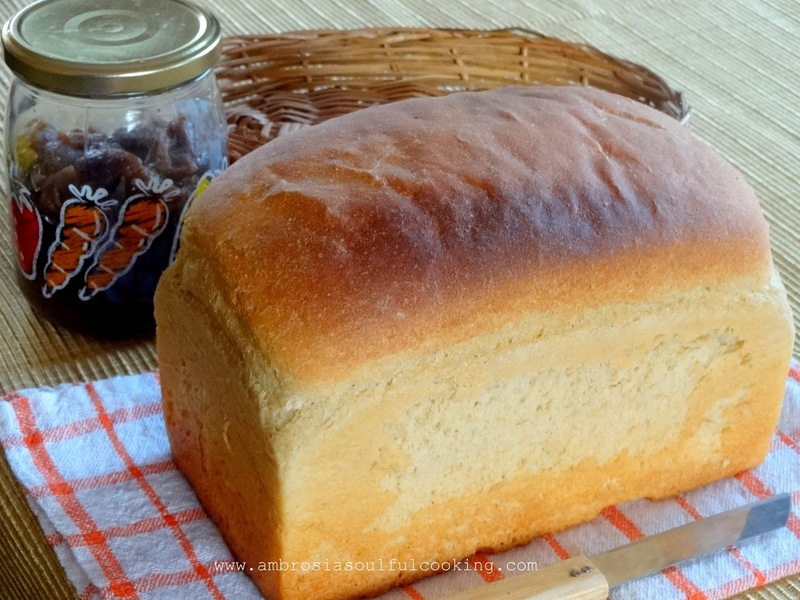 When I saw this loaf in Flyod Mann’s site, I was a bit apprehensive to try it out. I thought that the grainy texture of Semolina would not give pliable dough. But step by step as I proceeded, I discovered that semolina is a wonderful medium to work with. All my apprehensions were swept away. The dough was soft and as good as the dough obtained from flour. It rose beautifully and baked well. It was delicious. The slices were wonderful in taste and needed no butter, jam or honey which are otherwise the accompaniments with my home made bread. I made Semolina loaf three times. First time, I thought perhaps it was a lucky coincidence or perchance that everything went fine and hence the amazing outcome. Sometimes it so happens that the first attempt of a recipe gives fantastic results. However succeeding attempts are not as good. 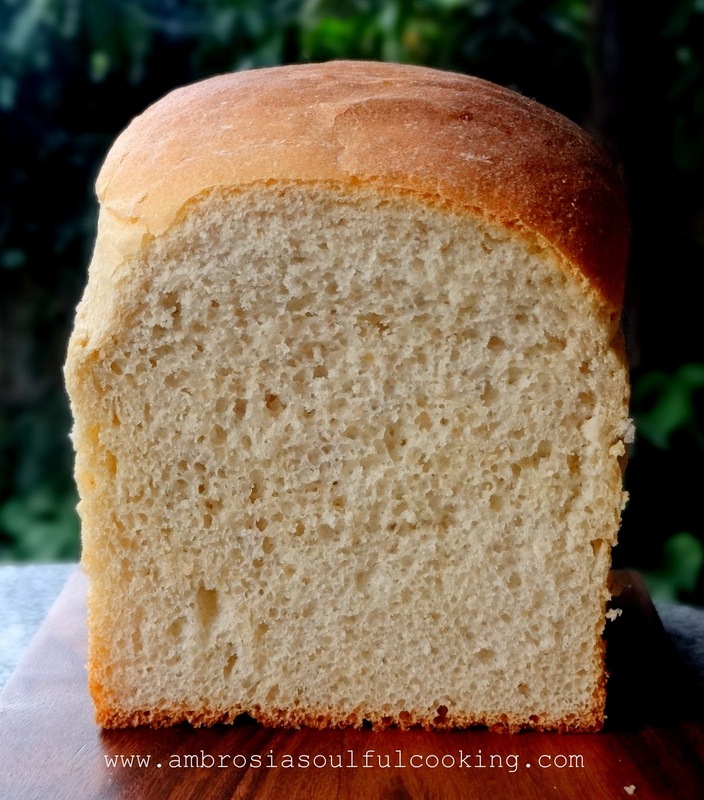 Assuming it to be this kind of a case, I baked Semolina Loaf twice again. Each time it was equally good and we loved it. Whisk together semolina, yeast, and salt. Add olive oil. Add sugar to warm water. Add water to semolina mix. Knead for 10 to 12 minutes. Initially, the dough feels dry and grainy but by the end of kneading, it becomes smooth and elastic. Transfer the dough to a greased bowl. Cover with a cling film and let it rise for 1 ½ hour. Remove from the bowl and knead for another 8 to 10 minutes. Using a rolling pin, roll out the dough into a rectangle no wider than the loaf tin that you are using. Roll the dough towards you, tightly. Pinch seams to seal. Place the roll in the greased loaf tin with the seam side down. Cover and keep it to rise for 1 ½ hour. Bake in a preheated oven at 180 degrees C for 20 minutes or till the loaf turns golden brown and the bottom sounds hollow when tapped. Remove from the loaf tin, cool and slice. Veganism is a philosophy and lifestyle. Most common reasons for becoming a vegan are spiritual concerns, ethical commitments or concerns for the environment. Proper and planned vegan diets satisfy all nutritional needs and are easy on the system. Being simple and nourishing, vegan diets keeps many modern day diseases at bay. Prefect crust and wonderful texture, fantastic loaves.. Amazed! 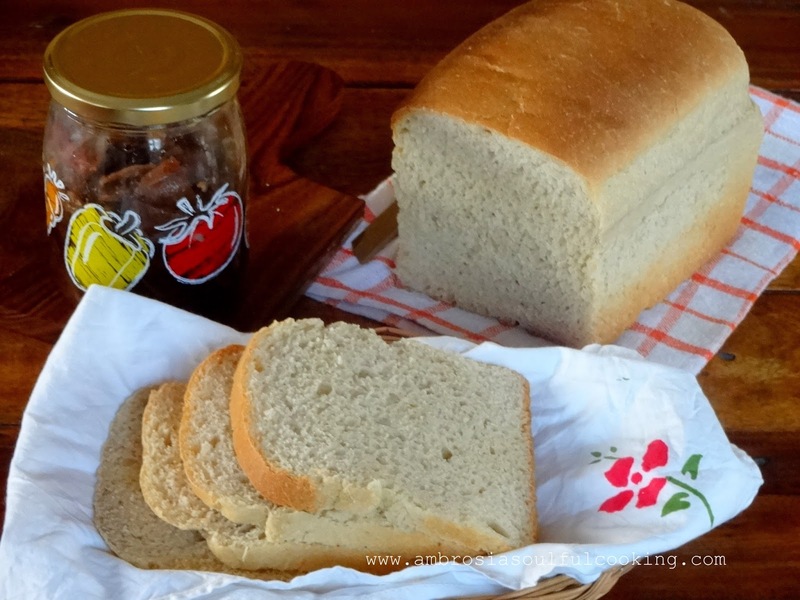 !Such lovely loaves with semolina. This must be tried soon. Hi,the loaf looks perfect. Please clarify if you have used fine sooji or rawa? what kind of semolina should be used here?awaiting your reply and then will try this recipe.thanks in advance! Hello! I have used the sooji commonly available in the stores.I have used Rajdhani brand commonly available here. If your semolina is a bit coarse and grainy, you can make it fine in your mixie. Looks like a great recipe to try! However,need your clarification on measurement issue. The standard cups available in Indian shops are 200ml (i.e. 1 cup = 200ml), however US 1 cup measure = 240 ml. Hello Pritika, I am a little late in answering you. I use 240 ml cups for all my breads, quick breads and cakes. Please go ahead and try it out. I am sure the bread will come out well and you'll love it. Happy Baking! 1. Whisk together semolina, yeast and salt. Add olive oil. 2. Add sugar to warm water. Does yeast give a better result when added to warm water? Can I do that? I am trying to prevent another disaster and wastage of food hence the question..
Hello, I am sorry that your bread did not come out well. Yes, you may add yeast to warm water with sugar and cover it for 10 minutes. If it begins to froth, it is alive and working. If it does not froth, discard it. I hope you are using instant dry yeast. Also, which step did you feel went wrong? did the dough rise? Please let me know. Hope second attempt is a success. Best wishes and HAPPY BAKING!